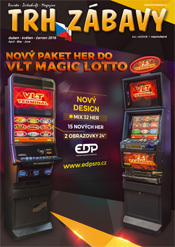 This advertising monthly magazine is sent free of charge to cca 3 000 companies in the Czech Republic. It is of course possible to publish both in English, English and Czech or in Czech only. These companies are mainly manufacturers of AWP, entertaining halls, operators, representatives and organizators of Exhibitions, agencies etc. Trh zabavy is the only magazine of this relation on the Czech Market and is sent also to Slovakia and Poland (partly to Germany, Austria, the Netherlands, Hungary, Ireland, the Ukraine and Russia). Furthermore we have exhibition stands in the Czech Republic, Slovakia, Poland, Hungary, IMA Show - Germany, ATEI Show - United Kingdom. Trh zabavy is also given out on every important exhibitions in Europe. Registered companies in abroad pay only the charge of postage. Should you have any questions, please do not hesitate to contact us. We will give you all the information. Deadline is 15th day of each month. Edition is 6000-8000 copies per month. Advertisements data: on CD or by E-mail, format PDF, EPS, CDR, TIFF, JPEG. Page size is 210 x 297 mm, layout size is 190 x 272 mm.